Police are testing the letter, Clark said. People in HAZMAT suits walk toward the home of U.S. Sen. Susan Collins in Bangor Monday. 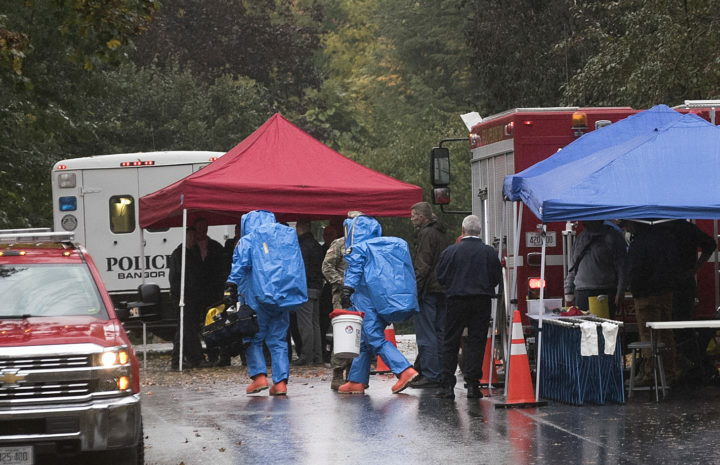 Collins, a Republican, was not at home Monday afternoon while local, state and federal law enforcement agencies, including a Hazmat team from Orono, investigated her West Broadway residence. Sgt. Wade Betters of the Bangor Police Department referred questions to the U.S. Capitol Police, the primary investigating agency. Police would not comment Monday on whether they had identified a suspect, who could face federal charges. Collins has been the target of harsh and sometimes vicious attacks both before and since she cast a decisive vote to confirm now-Justice Brett Kavanaugh to the U.S. Supreme Court earlier this month. Kavanaugh overcame three allegations of sexual assault in the weeks leading up to his confirmation Oct. 6. He denies the allegations. It’s not clear if the suspicious envelope delivered Monday was in response to Collins’ vote to confirm the judge — a decision she kept private until the day before the vote, when she revealed her support in a 45-minute-long speech on the senate floor. Seen as one of three key Republican swing votes that could sink Kavanaugh’s nomination, the senator had been the target of sometimes nasty voicemails from members of the public attempting to persuade her against voting for the judge. Since casting her vote, some Mainers have protested outside of Collins’ Bangor home. But Collins has appeared to go about her life in Bangor without signs of increased security. Over the weekend, she was spotted shopping at a local grocery store with her husband, and attending church. As the rainy afternoon wore on Monday, the police presence outside Collins’ home intensified. Yellow crime tape cordoned off the senator’s stately gray home, and authorities shut down the intersecting side street, Hayward Street, to use as a staging area for tents and police vehicles involved in the investigation. The Bangor Criminal Investigation Division, the Bangor Fire Department and an Orono Hazmat team were first on the scene, but by 4:30 p.m., the FBI and a fleet of unmarked vans and police wearing military uniforms arrived. Collins arrived home from Washington, D.C., around 7:30 p.m., after most police had cleared. “We are very grateful for the immediate and professional assistance that we received from the Bangor Police Department, the Maine Crime lab, the Maine State Police Department, the Capitol Police, the FBI, the Orono Hazmat Unit, the Bangor Fire Department, the U.S. Army, and the U.S. Postal Inspection Service,” Collins said in a joint statement with her husband, Tom Daffron, on Twitter. “We are also truly appreciative of the many well wishes that we received today. Our friends and neighbors have been incredibly kind and have even offered to open their homes to us. We feel blessed to live in such a supportive community,” the statement continued.